Defensive income stream with ASX liquidity. Since the Global Financial Crisis, many Australian investors have relied on term deposits for this defensive exposure, but with interest rates averaging less than 3 per cent before tax, the investment barely keeps pace with inflation. Fixed-income assets, such as bonds, are defensive and can play an anchoring role in a diversified portfolio. Bonds are negatively correlated with shares and generally have lower risk. Regular interest payments provide a steady and predictable source of income, and at the end of the bond’s term the face value is returned. They are usually the domain of institutional investors. Until recently retail investors could only access corporate bonds via a fixed-income fund or ETF. They could not pick and choose which corporate bonds they wanted to buy in the same way they could shares. Exchange-traded bond units (XTBs) issued by the Australian Corporate Bond Company (ACBC) have changed that and offer a new fixed-income investment opportunity for all investors. XTBs bring together the income and capital stability of corporate bonds with the transparency and liquidity of the ASX market. Australian companies can raise money via equity (issuing shares) or debt. The latter can take two forms – borrowing from a bank or issuing bonds. 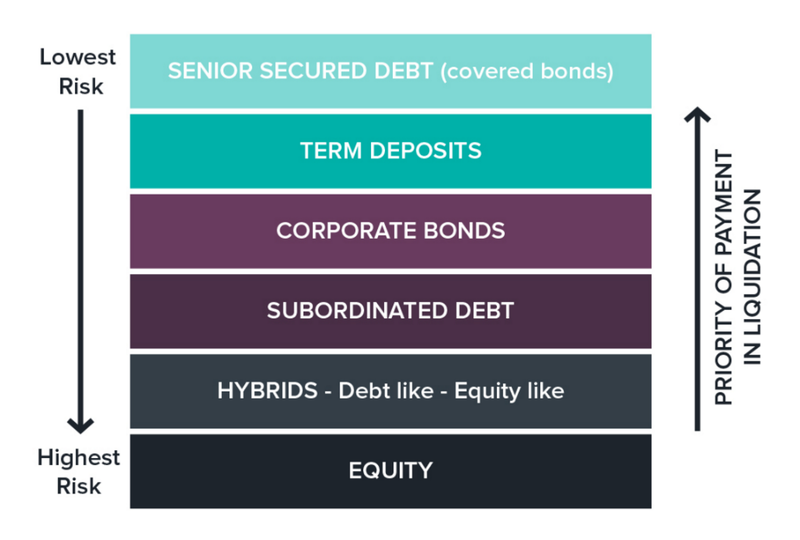 Corporate bonds share many characteristics with other types of bonds. The main differentiator is that they are issued by companies rather than governments or statutory bodies. The face value of the bond (e.g. $100), which is repaid when the bond matures. The coupon or interest payments made over the life of the bond. When investing in a company it is important to understand where your investment sits in its capital structure. Figure 2 below shows the hypothetical corporate structure of a bank. Corporate bonds are lower risk than hybrids and equities and, in the event of a default, bondholders would be repaid before shareholders. The capital ranking of securities also indicates the price stability of each. Corporate bond prices/yields are generally far less volatile than securities ranked below them in the structure, such as equities and hybrids. Exchange-traded bond units (XTBs) provide investors with access to the returns of individual corporate bonds. They are securities traded on ASX that bring together the predictable income from corporate bonds with the transparency and liquidity of the ASX market. They provide investors with exposure to a specific underlying corporate bond of an ASX 100 company, such as Telstra, Westpac or BHP Billiton. The performance of each XTB closely follows their individual bond counterpart in the wholesale market. Each has the same maturity date and coupon payment frequency as its corporate bond. For example, a three-year corporate bond with a coupon of 5 per cent translates to a three-year XTB with a coupon of 5 per cent. Importantly, XTB investors receive 100 per cent of coupon payments, as well as the face value at maturity. While many corporate bonds have a coupon that is fixed, others have floating-rate coupons pegged to an industry benchmark with a fixed margin above that. For example, a floating-rate note that tracks the Bank Bill Swap Rate (BBSW) and offers investors 0.75 per cent above this rate, would have a coupon referred to as BBSW + 0.75 per cent. This flows through to the relevant XTB. The yield and price of each XTB reflects the yield and price of the underlying bond, after fees and expenses. For fixed-rate XTBs, the fees are 0.4 per cent of the face value each year for the life of the bond, and 0.2 per cent per annum for floating-rate XTBs. The impact of the XTB fee is to lower the yield of the XTB compared with the bond. A corporate bond trading in the wholesale market at a yield of 4.8 per cent becomes an XTB trading on ASX at about 4.4 per cent. No other product fees are payable. Brokerage paid to stockbrokers is the same as other ASX securities. A positive attribute of the XTB is its parcel size. Investors can allocate as little as $100 to each XTB selected (broker dependent). This gives the investor control to build a corporate bond portfolio to meet their specific investment, and income, objectives. The XTB website offers a simple three-step, interactive cash flow tool that enables investors to build a portfolio of XTBs and map its cash flows. That way, investors can ensure the portfolio meets their income needs. Once an investment decision has been made, the order for an XTB is executed in the same way as for other ASX-traded securities. Transactions are settled through CHESS and each XTB is listed on the investor’s CHESS account. No additional account opening documentation is required. There are currently 47 XTBs available (10 floating rate, 37 fixed rate) across a broad range of ASX 100 companies, spanning most industry sectors. More XTBs will be launched on a regular basis throughout the year. Corporate bonds mature, at which point investors receive the face value of their investment, having already received coupon payments for the duration of the investment. Fixed-income securities are usually negatively correlated to shares and property, providing diversification benefits to an investment portfolio. Transparency through ASX, which enables investors to monitor the value of XTBs on an ongoing basis. XTBs are liquid investments. Investors can buy and sell on ASX at any time, just like shares (subject to liquidity). Unlike term deposits there are no penalties for selling out before the maturity date. Credit risk. That the bond issuer defaults on payments of coupons or principal. Liquidity risk. That of not being able to sell XTBs on ASX. Market risk. Of adverse market movements that impact the underlying corporate bond and therefore the XTB. Richard Murphy is the CEO and one of the founders of ACBC. He has more than 20 years’ experience of developing new markets, products and services for ASX Limited. Australian Corporate Bond Company was established in 2013 to develop the XTB fixed-income investment opportunity. More information on XTBs is available here. Cash-flows tools for XTBs and Fixed Income Starter Packs are other resources. This article appeared in the April 2017 ASX Investor Update email newsletter. To subscribe to this newsletter please register with the MyASX section or visit the About MyASX page for past editions and more details. This article appeared in the April 2017 ASX Investor Update email newsletter. To subscribe to this newsletter please register with MyASX. This article appeared in the April 2017 ASX Investor Update email newsletter.